Heat oven to 425°F. Place Reynolds™ Baking Cups in 12 regular-size muffin pan; spray with cooking spray. In 10-inch nonstick skillet, stir hot water and sauce mix (from Hamburger Helper box) until dissolved; stir in milk and uncooked pasta (from Hamburger Helper box), and heat to boiling over medium-high heat. Reduce heat to medium-low; cover. Cook 10 to 12 minutes, stirring occasionally, until pasta is tender and liquid is thickened. Remove from heat; stir in Cheddar cheese. Divide pasta mixture evenly among muffin cups. 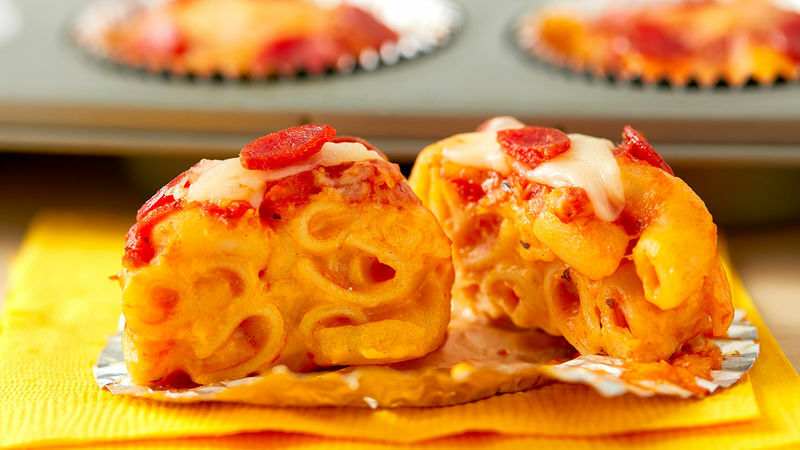 Add 2 teaspoons pizza sauce and 2 teaspoons mozzarella cheese on top of pasta mixture in each muffin cup; top each with 5 slices pepperoni. Bake 9 to 11 minutes or until cheese is melted and mixture is heated through. Let stand 5 minutes before serving. For easy serving and cleanup, line muffin cups with Reynold's™ Baking Cups. Find mini pepperoni in the meat department of your favorite store, or top with chopped pepperoni or your other favorite fully cooked pizza toppings.